Ordnance Survey Memoirs of Ireland, Vol 31: County Londonderry XI. 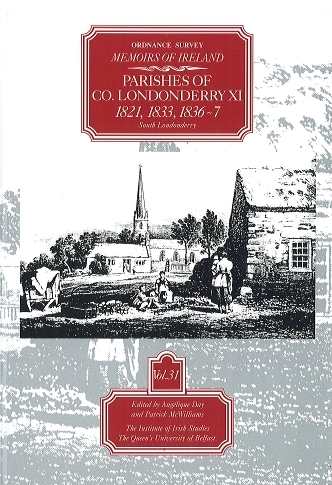 This volume contains the Memoirs for five parishes in south Londonderry, in the shadow of Slieve Gallion and including the towns of Draperstown, part of Moneymore, and Tobermore. Much of this district was owned by the Drapers' Company, whose regulations and benevolence greatly influenced their tenantry. This was a thriving area well endowed with remains of antiquity, gentlemen's seats, mills and public buildings, and its commercial character is attested to by a variety of occupations, fairs and markets. Social life is especially well documented through habits of the people, emigration and education, with wonderful accounts of the traditions, customs and verse of its inhabitants. Together this material provides a unique insight into life in this area over one hundred and fifty years ago.